Susan Anderson is the owner and operator of Native Naturals Farm. Her family has lived on and worked the same land since 1826. The farm produces organically grown herbs, nuts and fruits, as well as grass fed beef. Susan comes from a long line of herbalists and healers. She began the study native plant medicine, collecting, growing and preparing, with her grandmother who was a well respected midwife and nurse. 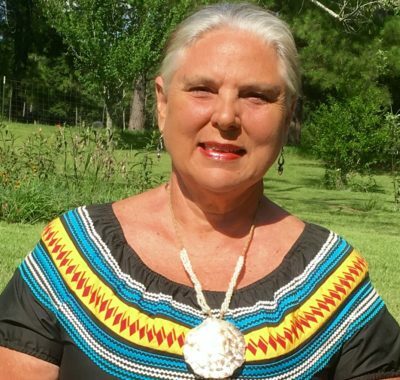 She is of both Creek and Cherokee descent, and has learned from traditional healers throughout the southeast. She is a traditional ceremonial person and draws heavily on her cultural roots in her relationship with the growing world. She has worked as a resource planner, journalist, educator and as a natural resource interpretive writer. She has served as executive director for two nonprofits, and consultant on numerous environmental and cultural projects. Her love of the land and respect for the food, fiber and medicinal value of native plants has been a guiding force in her life. She is a traditional fiber artist working primarily with native plant fibers and dyes. She has developed an intimate and comprehensive understanding of her land, its ecosystems and cycles, and how these things relate to the unique “medicine of place”. Her non traditional academic education includes degrees in sociology and religion from Florida State University. Graduate studies in urban and regional planning at FSU, and cultural sustainability at Goucher College in Baltimore MD.